One of the things Straightforward is renowned for is its strong methodology strand. With its clear and practical approach and a Teacher’s Book written by Jim Scrivener, author of Learning Teaching Third Edition, it places teachers in a perfect position to build on their own professional development. Teacher training videos – samples from the Teacher’s Book Resource Disc that show expert teachers demonstrating a variety of teaching techniques. Teaching made simple guides – handbooks from the Straightforward author team that help explain practical and sometimes challenging areas of ELT. The Straightforward Teacher’s Book is one of the best around. Written by Jim Scrivener, it contains extensive teaching notes and extra tasks and ideas for every lesson plus more detailed notes on the language and cultural content of the Student’s Book material. Each Teacher’s Book is accompanied by a Teacher’s Resource Disc in the back of the book, with five new videos from Jim Scrivener’s Learning Teaching Third Edition that link to the regular Straightforward Methodology sections and show experienced teachers demonstrating the techniques outlined. Teachers also have access to Straightforward Practice Online where they can ‘link up’ with their students to monitor their progress. Suggestions for extra activities for stronger classes, weaker classes and younger classes. 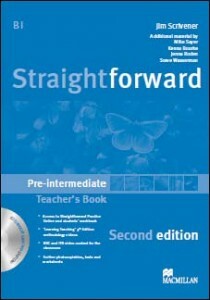 ‘Straightforward Methodology’ plus video demonstrations to help teachers develop further as teachers by expanding on their range of teaching activities and techniques. Supplementary language notes for tricky grammatical and vocabulary activities and cultural notes to give vital answers about British and American culture. Teacher’s Resource Disc includes 48 photocopiable worksheets, unit tests, progress tests, end-of-term and end-of-year tests (with listening).